Free download MultiPing latest version. MultiPing is a software application which helps to find out the ping of IP address of a webpage of different monitors. In order to identify the reaction of the URL on the internet, you can use a ping process. This ping operation actually sends some bytes of the data back and forth within you and the required web address host. So, identify time duration which it takes to come back to you. You can find out the Ping of IP. MultiPing is a software solution which is structured actually for the Ping Operations. Along with that is useful in continuous performance of the operation on the required targets. Moreover, you can have different IP addresses on your computer screen at the same time. You can also have a graph describing the history of last few minutes of the targeted address. If you are going to choose a website to ping, you are not required to go to the main infrastructure of that website. You have to go to MultiPing and just simply put the URL of targeted website, in this way the software will takes care of the next time. This software application also reveals the DNS and average response time of the website along with the IP address. 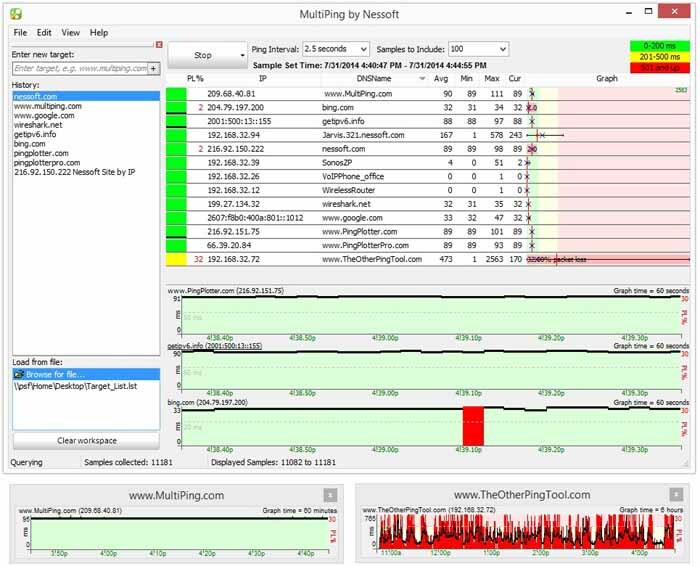 MultiPing allows looking after the various targets at a time but along with this it also enables users to get their server uptime by having surveillance on the hosts. Along with all above features, you may set the alerts system which will notify you when there is high packet loss and latency are going to be detected by the software. Or you can set these conditions manually. MultiPing will notify you the conditions will met with your manually conditions.